FHP Health Center in Guam was approved in January as the newest affiliate of the National Cancer Institute Community Oncology Research Program (NCORP) to bring cancer clinical trials and cancer care delivery studies to people in their local communities. University of Hawaii Cancer Center Minority/Underserved NCORP team visited FHP Health Center-Guam in 2018 to determine its capability and interest in becoming an NCORP affiliate site. 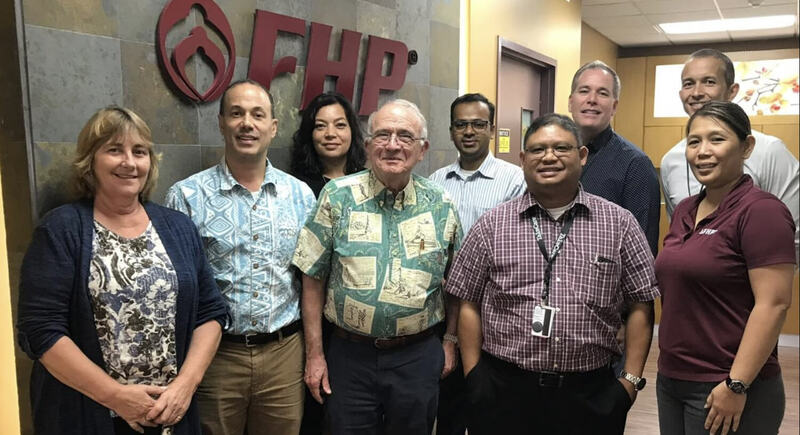 In the back, left-to-right: Munirih Taafaki, former UHCC regulatory supervisor; Samir Ambrale, MD, MPH, Hematology-Oncology; Jeff Larsen, FHP Vice President; Dave Torre, FHP Senior Clinic Manager. In the front, left-to-right: Isobel Webster, former UHCC Clinical Research Associate; Charles Rosser, MD, MBA former UHCC Translational and Clinical Research Associate Director; Jeffrey Berenberg, MD, UHCC NCORP principal investigator; Gerry Patricio, Manager Radiology Services; Josette Baza, EHR Specialist. FHP Health Center's affiliation with the University of Hawai‘i (UH) Cancer Center's Minority/Underserved NCORP site will allow patients in Guam to participate in NCI-sponsored cancer clinical trials through the national NCI-supported network. Guam is a U.S. island territory in Micronesia, in the Western Pacific about 3,950 miles west of the Hawaiian Islands. The residents of Guam are U.S. nationals. "Currently, Native Hawaiians, Pacific Islanders and Asians represent a small fraction of patients enrolled in NCI-sponsored cancer clinical trials nationwide. The inclusion of Guam to NCORP will increase accruals of underrepresented populations including ethnic minorities and rural residents," said Jeffrey Berenberg, MD, UH Cancer Center's Hawai‘i Minority/Underserved NCORP principal investigator. Dr. Berenberg added that there is a "great need to introduce cancer control, prevention and cancer care delivery research trials to Guam given the heterogeneous population, geographic location, unique cultural practices and diet." Samir Ambrale, MD, MPH, principal investigator of FHP Health Center-Guam, said that efforts had been made in the past to get NCI-sponsored cancer clinical trials to Guam. 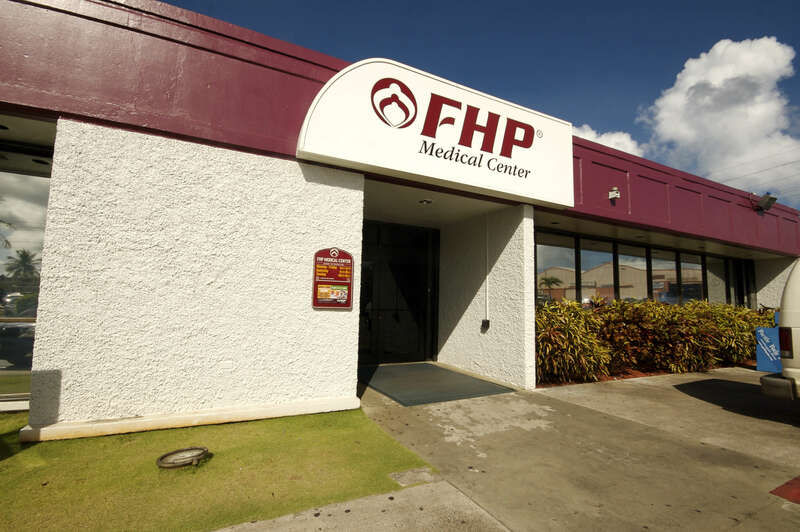 FHP Health Center-Guam, the newest NCORP affiliate. "Most (95%) of the cancer care is delivered locally in Guam," Dr. Ambrale said. "Patients are advised about enrollment in cancer clinical trials available in Hawai‘i or the continental U.S. for treatment of advanced cancer, but are routinely unable to travel for cancer care due to financial reasons and lack of social support. The new affiliation with the University of Hawai‘i Cancer Center NCORP program will allow for cancer patients in Guam to have access locally to the latest treatments through cancer clinical trials." "We are delighted to be partnered with the UH Cancer Center and are committed to providing novel cancer therapies and treatments to our island residents," said Jeffrey Larsen, FHP Health Center vice president. The majority (81%) of Guam's population of 167,772 consists of Native Hawaiians, Pacific Islanders and Asians. During the period 2008-2012, 1,904 new cases of cancer were diagnosed in Guam and 736 residents lost their lives to cancer. "Researchers at the UH Cancer Center, FHP Health Center and the University of Guam have been working diligently for months to complete requirements for joining the NCORP," said UH Cancer Center Director Randall Holcombe, MD, MBA. "The addition of FHP Health Center to NCORP's list of sites has been possible due to collaborative efforts to elevate the level of cancer care, increase the availability of new treatments and help eliminate cancer related disparities in the region."